He boarded the plane, and on his fight back home, he couldn’t help wondering what kind of golf club the king might give him. He imagined that it might be a solid golf putter with his name engraved on it. Or maybe it would be a solid gold putter with his name engraved on it. Or maybe it would be a sand wedge studded with diamonds and jewels. When the golfer got home, he watched the mail and the delivery services every day, to see if his golf club had come yet. Finally, several weeks later, he received a certified letter from the king of Saudi Arabia. The golfer thought that rather strange. “Where’s my golf club?” he wondered. He opened the envelope, and much to his surprise, inside he discovered a deed to a five-hundred-acre golf course in America. I don’t know if this story is true or if it’s simply an urban legend but it does shine light on an important point. Everyone is born to think big. But for various reasons we have limited our vision. We think we don’t deserve the best. We settle. Maybe it’s because of the “dream thieves.” These are the people that want to pour water on you, shake you and do whatever they can to wake you when you are having a dream. Stay positive and surround yourself with positive people that will encourage you and build you up. Always believe in your dream and follow it. You’ll be amazed at what will happen. If you want to experience the best of life you have to believe that you deserve the best of life. Too many people think and are taught that they don’t deserve the best. Some even pray, “Oh Lord, I know I’m not worthy but…..” We need to put an end to that mindset. Anything that you feel you’re not worthy of, you can’t have. If you feel that you don’t deserve it, you won’t obtain it. But the truth is you can have anything and be anything you want. If you’re waiting to be told that you deserve the best, then consider yourself told. YOU DESERVE THE BEST! Enlarge your vision to see that you can do what you set your mind to. Negative thoughts are unproductive. They disrupt your progress. Learn to turn off any negative thought that pops in your head. Rather, dwell on the positive. Make a habit of thinking positive thoughts and speaking positive affirmations. You must change your thinking. Your creator designed you for success and greatness. But you will achieve success and greatness at the level of your expectancy. If you expect little, that’s what you’ll get. If you expect much, that’s what you’ll get. It’s time to expect much! 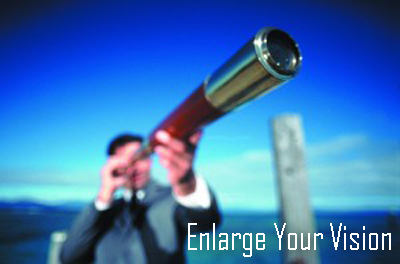 It’s time to enlarge your vision! Tagged affirmations, Creator, Destiny, Dream, expectations, greatness, happiness, happy, Life, positive thought, success, thought, Vision, visions. I agree on your take with negative thinking. It destroys your momentum. A great post!